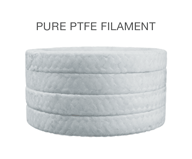 Teflon® filament yarn with PTFE dispersion and an inert break-in lubricant. Chemically resistant 0-14pH – reduce inventory costs. Non-contaminating – will not degrade product. Non-Asbestos – reduce handling cost. High strength – longer life. Reduce maintenance and parts costs. Highly corrosive media – aggressive acids, strong caustics and solvents. Chemical service at low to medium shaft speeds. Applications demanding a chemically resistant compression packing. Rotating equipment applications and valve service.